Joining the likes of the Pedaltrain Volto, Palmer's Batpack pedal power supplies offer a rechargeable source of power for guitarists, but their almighty mAh outputs promise substantial battery life. Two Batpacks are available: the Batpack 4000, with 4,000mAh battery capacity, and the Batpack 8000, with 8,000mAh capacity. Both devices feature lightweight aluminium chassis, two 500mA 9V outputs and a USB output, especially handy if your phone or tablet features in your guitar rig. Battery life is dependent on how many pedals you're running from the supply, but the 4000 claims to offer four hours of play time, while the 8000 gives you eight. Judging from the 9V outputs, it sounds like 1,000mA is your recommended maximum output, so it's probably best not to go mad with digital pedals. Charge time is four hours for the 4000, eight hours for the 8000, and a five-segment LED shows you how much battery life is remaining. 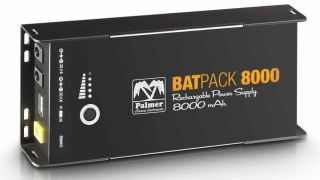 Palmer's Batpack 4000 and 8000 are available in Q3 2016, with pricing TBC.